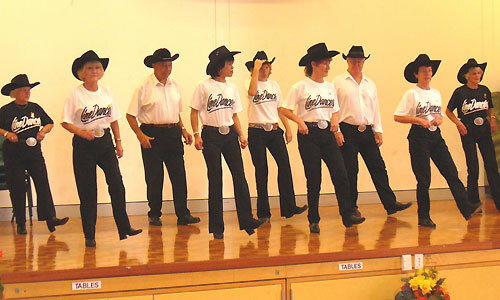 The Boot Scootin Line Dancers have travelled both the North and South Islands of New Zealand as well as across in Sydney, Australia teaching at Line Dance Workshops attended by up to 250 people. They currently teach around 11 Line Dance Classes a week. Guest Appearance with my friend Don Kay on the Sports Café Show with Mark Ellis and Lana Cockcroft. as well as many club and corporate events including Air NZ, Rotary Organisation, Waitakere City Council and the Auckland Zoo. The Boot Scootin' dancers can offer a demonstration and easy lesson in Line Dancing. It's suitable for all ages, easy to pick up and makes for an entertaining, interactive element after dinner for a wide variety of functions.